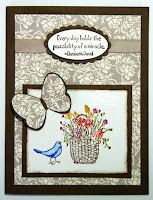 I featured the set Peace Within for the blog tour and made three different cards with the set. I love the set, but when I first sat down with it in preparation for the tour I was really at a loss of what to do. I looked at the two picture stamps and two sentiments and thought, oh my, why did I choose to feature this set? But I'm so glad I did. It has actually forced me to look at the set with new eyes. In today's post, you will see that I totally altered the look of the chair by removing the cat and the pillow. I used a marker to outline the chair so I could leave out the cat and the pillow - I wanted to cut the chair out and have it empty on an empty dune. I stamped it and then just drew in the lines for the rest of the chair where the cat and the pillow had been located. I used a brayer to do the sand and the sky, stamped the grasses with Inspired by Nature and then attached the chair with dimensionals. The sentiment came from the set Hope Happens. Looking at this card makes me long to go sit with a book, all alone and soak up the nature around me. I hope you enjoy my take on this stamp and that you too will think outside the box when you look at your stamps. Thanks again to everyone who stopped by my blog during the Royal Blog Tour. Happy Stamping. I am excited to announce Blog Candy winners from the Royal Blog Tour! The winners are Tenny Kusuma and Laurie in MN.! I will give Laurie's last name as soon as I hear back from her. I have emailed both ladies and congratulated both of them. I want to thank everyone who commented on my cards and made me feel like a princess. I hope many of you will continue to check back as I update frequently. I wish everyone could have been a winner, but alas, just two. Congratulations again Tenny and Laurie. 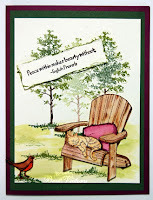 I am so excited to be a part of the Royal Blog Tour and to feature Peace Within a new stamp set from the new 2009-2010 Stampin' Up! Idea Book & Catalog. I loved this set the moment I saw it and it was one of the first I ordered from the new catty. The set is small, just four stamps, two pictures and two sentiments, but I think it will prove to be very versatile. My first card features the sleepy, peaceful cat and uses the new In Color Rich Razzleberry along with a favorite of mine Old Olive. I did a lot of stamping and cutting to add dimension to this card and as you will see later eve delete part of the picture. The only thing wrong with this picture is that the cat is in the chair not me! 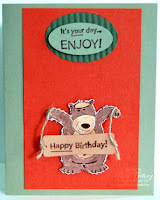 My second card is a very simple card using Soft Suede and Bella Blue Designer Series Paper. I added some pizazz with the butterfly - punched with our new Butterfly Punch. I had planned to watercolor card too, but ended up using markers to color the stamp and then I stamped it on watercolor paper. The only part I colored in was the bird. I liked the simple look with the different colored flowers. My last project for the blog is a bookmark card. I placed the sentiment on the card and again on the bookmark. I like to frame cards like this and so I didn't want the sentiment to disappear with the bookmark. I love these because they're quick and easy gifts, but ones with a very personal touch! This design idea was cased and I will provide more details including a link to the instructions following the blog tour. What I love to do with a new stamp set especially one like this is sit down and see how many different stamps I have that will go with it. In this case I used Le Jardin with card number one, card number two was strictly this set and my third project included the sentiment from Sense of Time and the background from the new set Paradise. 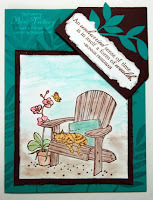 I actually found three different sentiments from three different sets to go with this sleepy peaceful cat in just a quick look through my stamps. I'm always amazed at how the stamps work with each other and expand our stamping horizons. Be sure to bookmark my blog or sign-up for the feed and come back on July 30th for more details on these projects! BLOG CANDY DETAILS: Like many of the blogs on this tour, I am offering BLOG CANDY. For Stampin' Up! Customers and demonstrators. I am offering a set of four different Sale-a-bration 2009 stamp sets. For demonstrators I am offering a set of instructions for these three projects with supply list and cutting instructions if they have the Sale-a-bation sets and would prefer the projects. These instructions are perfect for a Stamp Camp or Stamp Club. I will be drawing two names To be entered into the drawing simply leave a comment including your email address and whether you are a demonstrator or customer. Winners will be contacted and announced on my blog July 30th. 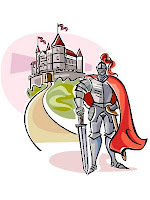 Be sure to click on my CROWN on the right side bar to arrive at the CASTLE on the Royal Tour Home Page. Today Pendant Park is my favorite new set from the new Stampin' Up catty. I will probably be saying that every time I use a new set. Wow, this is the best year ever for stamp sets and all years have been good. I love the little squirrels on the park bench, reminds me of a park near where we run and thus I loved this set in the catalog, but I love it even more since I've used it. 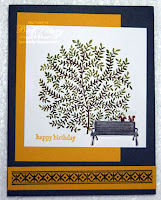 The first card I used Old Olive and Crushed Curry (new In Color) and of couse Whisper White. I colored in the tree with three different markers, Always Artichoke, Old Olive and Chocolate Chip and I love the texture it gives the tree. I stamped the bench and then cut it out and raised it with dimensionals - I just like the depth doing this gives to the card. The legs were iffy, but I got it done! If you have this set enjoy it and if you don't you can always contact me to place an order! I promise it will become one of your favorite sets, too! I love this set and when the Chat & Challenge on SUDSOL yesterday was for one color base card with no layers except for one popped element - I thought of this set. I used Kraft Paper and Chocolate Chip Ink. The sentiment stamp is from Nature Silhouettes - love it! 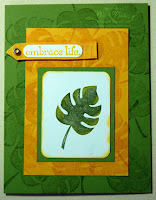 I embossed and cut out one leaf and popped it on the card with dimensionals. Simple, but pretty. A very quick card. Like many others on the tour I will be offering Blog Candy. To be entered in the drawing you must leave a comment and your email address on my blog. You must also say whether you are a demo or customer (non-demo) - sorry, U.S. Customers and Demos ONLY. My blog candy will be a set of four 2009 Sale-a-bration stamp sets. If you are a demo and already have all four sets, you can choose to have directions for my three projects including supply list and cutting details. Any or all of the projects would make great projects for stamp camps or clubs. I will be drawing two names - I will contact winners and post on blog- Thursday, July 30. I wish everyone could be a winner, but alas only two of you will take home the candy. But remember you can't win if you don't enter - see you on the tour. I love this set! I used it for my new catalog sneak peak and here it is back again. This time I used it for my daughter's birthday card, which by the way was in early July. It is so verstile and I think it's one of the best Hostess Stamp Sets in a long time. Ok, maybe that's the way I feel every year! It's good to always be excited about what's new and currently available. I used the words from Inspired from Nature and again I love how we can combine the sets to come up with even more layouts. I used Watercolor Paper, inkpads and our watercolor brush, the base card is Real red, the dragonflies on the red are the same color - I l ove that effect. 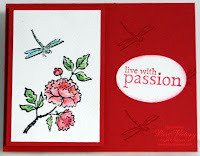 Live with passion was stamped in Real Red on Watercolor paper and punched out with the wide oval - real red sponged on edges. I will do more with this set soon (maybe even use one of the other stamps LOL) - keep your eyes open and think of this set seriously when you think about Hostess Stamps! I am having so much fun making these bookmark cards. I got the idea from Barb at http://www.barbstamps.com/my_weblog/2009/04/supr-cool-bookmark.html and she got it from her Controlfreaks swaps - Yvette was her source. Now you know I wish I had last names etc., but I don't so I've given you the link to Barb's site and on it you can find explicit, wonderful instructions for making this card/bookmark. It's so easy and quick and who doesn't need an easy and quick gift? We made these at my Open House on Tuesday night. We used the new In Colors, Rich Razzleberry and Melon Mambo. Don't you just love these new colors. I love how well they go together and how they are the perfect combo for so many of our "regular" colors. For those of you new to Stampin Up we have 48 colors divided into four color families and then evey year we get an additional six colors known as the "In Colors." Back to the card: In this case it's a card front only and I just wrote a quick note on the back when I sent it to a friend this week - the bookmark part just sits on the upper right corner of the card and slips off to go to their b ook! 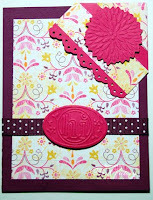 We used the Big Shot and embosslits to decorate the cards along with the new Designer Series Paper (DSP) Razzleberry Lemonade. This gorgeous and versatile paper can be found on page 162 of the new catty for just $9.95. The embosslits are on page 195 and the HI is a new one! These are so much fun because they emboss and cut out at the same time. The flower on the bookmark is the flower burst. Again, easy as can be and so much fun. Give it a try, they're very addictive. I love Hawaii or any other tropical area (live in one you know) and so I was very excitd to see the new Stampin' Up stamp set called "Paradise". Plus, it's leaves and I love leaves. So I combined Old Olive and Crushed Curry (new in color for 09-10) with a little whisper white and made this card encouraging the recipient to embrace life. I originally made this card from a sketch for a chat and challenge and then used the finished product for my Open House Tuesday night. I love the new in colors and how well they go with our family colors. Wrecked can mean so many different things. Like I wrecked my car - obviously that means the car has damage! My week was wrecked by the car wreck! Now that ones means that everything I had planned for the week suddenly was put on the back burner or "messed up" similar to the car, my week was damaged! You ask what does this have to do with stamping? The answer is simple - I wrecked my car on Tuesday afternoon and the rest of my week was suddenly also a wreck! I didn't accomplish any of the things I had planned for the week including stamping. Without stamping, there is no blogging! 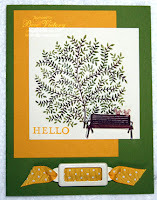 Now to make things even brighter - I am stamping like crazy to get ready for my open house on Tuesday and the blog tour begining the 26th, so I will have a new post up tomorrow with a card. Sleep tight - see you tomorrow! I used Mellow Moss and the Dusty Durango and markers to color in my bear and the smore! 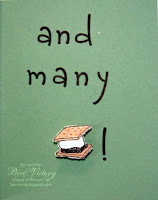 Oh, my there's no smore - oops, I need to upload the inside of the card - after all wh at follows Happy Birthdy but many smore! I hope you enjoy! Wish you had one don't you? I'm telling you the memories are something else!